The latest round in the ramping up of U.S. security assistance to Mexico and Central America began during President George W. Bush’s second term in office. Funding allocated to the region’s police and military forces climbed steadily upward to levels unseen since the U.S.-backed “dirty wars” of the 1980s. As narco-trafficking operations shifted increasingly from the Caribbean to the Central American corridor, the United States worked with regional governments to stage a heavily militarized war on drugs in an area that had yet to fully recover from nearly two decades of war. 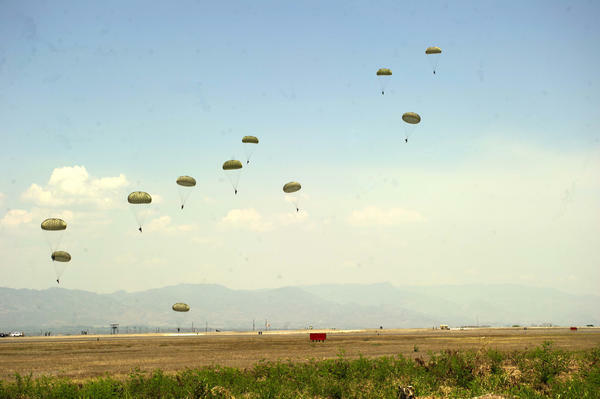 In 2008 the Bush Administration launched the Mérida Initiative, a cooperation agreement that provides training, equipment, and intelligence to Mexican and Central American security forces. A key model for these agreements is Plan Colombia, an $8 billion program launched in 1999 that saw the mass deployment of military troops and militarized police forces to both interdict illegal drugs and counter left-wing guerrilla groups. Plan Colombia is frequently touted as a glowing success by U.S. officials who point to statistics indicating that drug production and violence has dropped while rebel groups’ size and territorial reach have significantly receded. Human rights groups, however, have documented the program’s widespread “collateral damage,” which includes the forced displacement of an estimated 5.7 million Colombians, thousands of extrajudicial killings, and continued attacks and killings targeting community activists, labor leaders, and journalists. Under President Obama, the U.S. government has renewed and expanded Mérida and, in 2011, created the Central American Regional Security Initiative (CARSI). From 2008 to 2013, these programs have received over $2 billion and $574 million respectively, according to a 2014 report by the Igarapé Institute. Though administration spokespeople emphasize investments made in judicial reform and drug prevention programs, most funds have been spent on supporting increasingly warlike drug interdiction and law enforcement. The surge in U.S. security assistance has coincided with a notable regional increase in the militarization of law enforcement activities. Starting in 2007, former President Felipe Calderón of Mexico began deploying tens of thousands of troops as part of his government’s crackdown on drugs and organized crime. In El Salvador troops were deployed in the streets in 2009 and their presence was increased in 2011. In 2011 and 2012 Salvadoran president Mauricio Funes appointed active and inactive military officers to top security posts, breaking with the tradition since the country’s 1992 peace accords of keeping these posts in civilian hands. In Guatemala, meanwhile, over 21,000 army troops have taken up policing missions, often far outnumbering the number of police personnel in the areas where they are deployed. According to the Center for International Policy (CIP) approximately 40% of Guatemala’s security-related posts have been filled by former military officers, since former army chief Otto Perez Molina’s 2012 ascension to the presidency. U.S. security funding to Honduras was briefly suspended following the June 2009 military coup. But by the following year the United States had resumed funding at a higher rate than before the coup, even though the Center for Justice and International Law noted that “high-ranking Army officers or former members of the Army against whom complaints were brought for their participation in the coup d’état, are occupying executive positions in government offices.” In November 2011 the Honduran government began sending military patrols into the streets to fight common crime, and in August 2013 a new Military Police for Public Order was created, tasked with cracking down on gang activity. Military involvement in policing duties had been prohibited under the Honduran constitution, but in January 2014 the country’s legislature amended the constitution to permit a military police force. Though the U.S. government has remained silent regarding military involvement in law enforcement activities, the steady increase of U.S. assistance to national armed forces has, if anything, been an indicator of tacit U.S. support. But the U.S. role in militarization of national police forces has been direct as well. 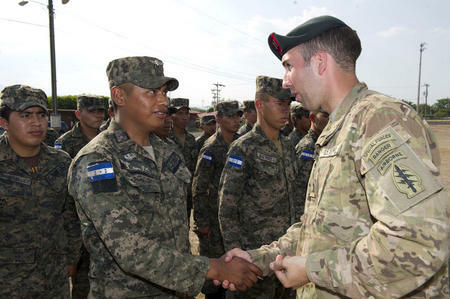 In 2011 and 2012, the Drug Enforcement Administration’s Foreign-deployed Advisory Support Team (FAST)—which had previously carried out military-style missions in Afghanistan—set up camp in Honduras to train a local counternarcotics police unit and help plan and execute drug interdiction operations in the Mosquitia, a remote region in eastern Honduras that has recently become a hub for the transit of drug shipments northward. Supported by U.S. helicopters mounted with high caliber machine guns, these operations were nearly indistinguishable from military missions, and locals routinely referred to the DEA and Honduran police agents as “soldados” (soldiers). According to The New York Times, five “commando style squads” of FAST teams have been deployed across Central America to train and support local counternarcotics units. In July 2013, the Honduran government created a new “elite” police unit called the Intelligence Troop and Special Security Group, or TIGRES (Spanish for “tigers”). The unit, which human rights groups contend is military in nature, has been deployed in tandem with the new military police force and has received training in military combat tactics from both U.S. and Colombian Special Forces units. Outside of Honduras, Colombian military and police trainers are now active throughout the region as well. Eager to help export the “successful” Plan Colombia model, the United States has funded training programs carried out by Colombian security forces in Mexico, Central America, and beyond. In 2012, President Obama and Colombian president Juan Manuel Santos announced a joint multi-million dollar Action Plan on Regional Security Cooperation that draws on “Colombia’s established and expanding expertise and capacity for countering transnational organized crime…and shared U.S. responsibility to address the demand for illicit narcotics,” according to a State Department release. Human rights groups such as the Fellowship for Reconciliation (see Lindsay-Poland, this issue) note that many members of Colombia’s police and military forces are—like many of their Mexican and Central American counterparts—implicated in extrajudicial killings and human rights abuses. Transnational crime organizations are believed to have permeated a large number of the region’s police and military units as well. The U.S. government presents the increased support to Mexico and Central America’s security forces as a necessary response to the alarming rise in drug-trafficking activity which has, in turn, fueled violent crime. But has U.S. policy borne positive results? The question is complicated because the United States and its partners have failed to publicly establish clear metrics to assess counternarcotics efforts. One of the few measures used by the U.S. Congress is “the pace of equipment deliveries and training opportunities” according to a Congressional Research Service Report, though this information says nothing about the effectiveness and impact of aid. U.S. officials highlight statistics showing that there is less cocaine available in the U.S. today than in the years prior to the Mérida Initiative, but it appears likely that this trend is counterbalanced by the increased availability and popularity of other drugs like heroin. What is certain is that the surge in U.S. security assistance has been accompanied by a dramatic spike in violent crime in several countries. Homicide rates have skyrocketed in El Salvador, Guatemala, and Honduras, the countries that have received the bulk of CARSI funding. Today those countries—often referred to as the Northern Triangle—comprise one of the most violent regions on earth. In Mexico, meanwhile, Human Rights Watch estimates that around 80,000 people have died in drug-related killings since 2006. Drug violence has also led to the displacement of over 200,000 Mexicans, according to the Internal Displacement Monitoring Center. U.S. officials have suggested that the epidemic of violence in the region actually indicates the effectiveness of the war on drugs. The head of the State Department’s Bureau of International Narcotics and Law Enforcement Affairs, William Brownfield, recently told the Associated Press that “the bloodshed tends to occur and increase when these trafficking organizations…come under some degree of pressure.” This theory doesn’t seem to be supported by any concrete evidence, and appears to disregard the fact that many of those killed have no links to drug trafficking. The chilling reality is that the majority of U.S. security assistance flowing to Mexico and Central America is going to police and military forces that only two decades earlier were engaged in horrifying acts of killing and torture against political opponents and indigenous communities. With few exceptions, security forces across Central America have undergone no serious reform since the 1980s, and the state agents responsible for past human rights violations have not been brought to justice for even the most egregious crimes, such as the massacre of entire villages. Today, the region’s judicial institutions—particularly in Mexico and the Northern Triangle—remain deeply corrupt and inefficient, and only a tiny proportion of crimes involving security forces are successfully investigated and prosecuted. The U.S. government has been reluctant to acknowledge the growing number of extrajudicial killings and human rights abuses reportedly perpetrated by members of state security forces receiving U.S. support. In 2011, Human Rights Watch presented evidence of Mexican security forces’ involvement in “more than 170 cases of torture, 39 “disappearances,” and 24 extrajudicial killings since 2006.” And these incidents are likely only a drop in the bucket. From 2007 to April 2011 Mexico’s Federal Prosecutor’s Office opened 1,615 investigations into alleged military crimes against civilians, but not a single one of these investigations resulted in a prosecution. As documented in an in-depth report by Rights Action and the Center for Economic and Policy Research, and by journalist Kaelyn Forde in NACLA’s Fall 2013 issue, on May 11, 2012, a drug interdiction operation involving Honduran police and DEA FAST team agents flew into the tiny municipality of Ahuas and opened fire on a passenger boat, resulting in the killing of four indigenous villagers, none of whom were known to have links to drug trafficking. To this day, the families of the victims of the Ahuas killings await justice and compensation from the Honduran and U.S. governments. And in a number of documented instances across Central America, attacks by security forces have targeted civil society groups engaged in peaceful protests or other forms of non-violent opposition. In Guatemala troops have killed indigenous protestors demonstrating against the government’s economic reforms. Honduran military and police units are accused of killing dozens of land rights advocates in the Bajo Aguán valley close to the Atlantic coast, and a peaceful demonstrator protesting a hydroelectric project further west in the Rio Blanco Valley. Killings and attacks against women, human rights defenders, lawyers, journalists, LGBT activists, union leaders, and political opposition leaders have risen sharply. In Honduras, many occur in death squad fashion, with individuals kidnapped by masked men in unmarked vehicles, shot and left by the roadside, sometimes with evidence of torture. Given the tactics, many suspect the involvement of security forces, but those responsible are almost never brought to justice. Citing these widespread abuses, human rights groups and many members of Congress have pushed back against the U.S. security spending frenzy. In 2012, 94 members of the U.S. House of Representatives demanded the complete suspension of police and military assistance to Honduras. Congressional appropriators have conditioned portions of security aid to Mexico and Honduras pending State Department certification of governments’ compliance with human rights and accountability provisions. They have also maintained a long-standing ban on foreign military funding and training of Guatemalan army units in appropriations funneled through the State Department. But the Obama administration has consistently certified Mexico and Honduras as compliant with human rights conditions in spite of, in the case of Honduras, public objections from over 20 U.S. senators. The ban on some security assistance to Guatemala is amply compensated by direct Department of Defense support to military units, among them those that reportedly include members of the Kaibiles, Special Forces troops implicated in past massacres. Recently, the United States began channeling more sophisticated and insidious forms of support to the region’s security forces. Through CARSI, the U.S. government has equipped police institutions with surveillance technology and encouraged widespread wiretapping activity. The overt intention may be to improve local law enforcements’ ability to intercept drug traffickers’ calls, but—given the absence of effective judicial accountability—civil society actors legitimately fear that this enhanced surveillance capacity is being directed at them. Despite the United States’ enormous investment, the State Department’s 2014 International Narcotics Control Strategy Report notes that “approximately 90 percent of illegal drugs from South America destined for the United States are smuggled through the seven Central American countries and Mexican corridor.” Why have billions of dollars been spent on a failed policy that has only generated more violence? And why, in an apparent repetition of the dark days of Central America’s dirty wars, does Washington invest so heavily in strengthening and empowering corrupt security forces with appalling human rights records? U.S. officials’ unwavering faith in the Colombian militarized model is no doubt part of the reason. But a stubbornly persistent Cold War mindset may also be at play. Based on hours of interviews with State Department officials and Congressional staffers, investigative journalist Hector Silva Avalos recently observed in an Inter-American Dialogue report that the U.S. security agenda in the Northern Triangle is driven in part by the perceived threat of the growing regional power of the Venezuelan government. A new “anti-American narrative,” he argues, has replaced the prior communist threat in the eyes of key policy makers. The U.S. government’s failed and destructive regional anti-drug policy now faces a swelling movement of resistance from Central American leaders and grassroots movements alike. Governments are debating alternative policies that include potential decriminalization of drug possession and use. Human rights groups and social movements are increasingly united in decrying the use of army troops and militarized police in repressing popular movements and defending corporations in their efforts to wrest resource-rich lands from communities. The priority, they believe, is building strong, transparent judicial institutions to address human rights crimes and ensure accountability. To eradicate the scourge of violent crime, investment is needed, not in military equipment and police and military training, but in equitable and sustainable economic development that addresses the basic needs of the poor.